An intimate restaurant with a stylish decor, the newly reenvisioned Radhika makes a great date restaurant, complete with courteous service, above-average food, and a convenient location. The Details: Two days before the school year was about to begin, my fiance (a teacher) was having a pre-school crisis. This is similar to a mid-life crisis but on a smaller scale. Terrified of the imminent loss of his freedom by a classful of boisterous 7th- and 8th-graders, Nick insisted we go on one last "adventure" before summer officially ended. We couldn't afford to go out of town for the long Labor Day weekend (the downside of wanting the huge Indian wedding), so we hopped on the light rail instead -- and decided to see where the night would take us. We lucked out by making a stop at the newly opened Radhika in South Pasadena. We discovered later that the restaurant had previously been located in a less-walk-in friendly location in the city of Pasadena and had moved and reopened its doors four months ago -- in this pedestrian-friendly spot immediately outside Mission Station. Maybe not an adventure in the traditional sense -- no 911 calls or explosions or even drunken diners -- Radhika was in its own way a culinary adventure for us because of its modern take on Indian cuisine. "We're trying to get away from saag and daal and really do things differently," said Kiran*, the owner, as he made his rounds. "I think people are ready for that." He added that the foods that need to be authentic will stay authentic, but for much for the menu, Indian spices will be used in inventive ways. We sat in a window seat and the atmosphere was lovely for a date -- cozy low-level lighting, blue walls, Indian music, and other subtle touches like custom-made light fixtures with an Indian scrollwork-inspired design. The space is also comfortable for small groups of friends, as there's a red striped banquette against a wall and tables for groups of two and four on the outdoor patio. 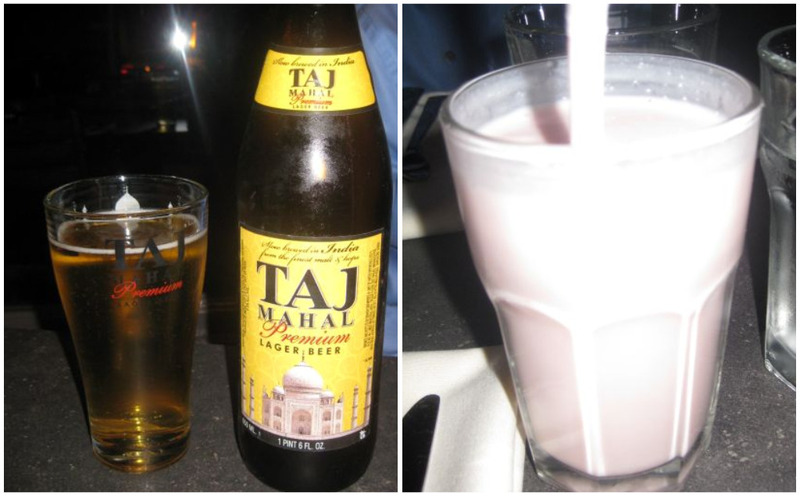 Nick ordered a Taj Mahal beer, which came in a cool logoed glass, and I ordered a Rose Lassi. The lassi was delicious. The restaurant also has a Mango Lassi on its menu, which is usually a safe bet at any Indian restaurant, but I can't promise I'll ever try it here as I'm really craving another rose-flavored one. The rose scent reminded me of Indian desserts like kulfi and sandesh. 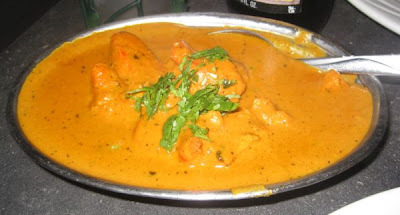 For his entree, Nick ordered the Chicken Tikka Masala -- one of our standbys. Here's where I thought the food started to fall a little flat. It was good, but it lacked the sweet and nuanced flavor that I expect in a great tikka masala sauce. I had the Kerala Fish Curry, described on the menu as a white fish and coconut curry topped with succulent pineapples. It was hard to tell which pieces were fish and which were pineapple due to all of the sauce -- but I do give Radhika props for incorporating fruit into the dish. (I'm a big fan of the all-in-one entree.) This dish was just OK. I'm not yet an expert on identifying all spices within a dish, but the spices were overpowering in this one. 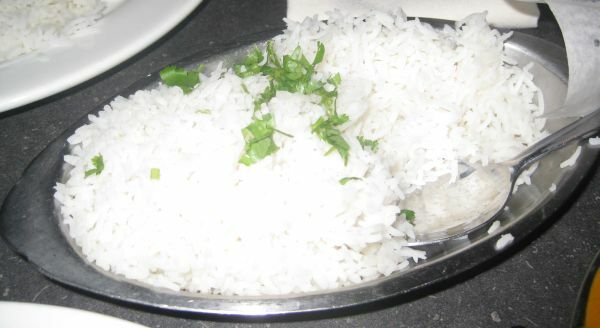 Like many restaurants, the rice had to be ordered separately. It's $4 here and was plenty for two people. 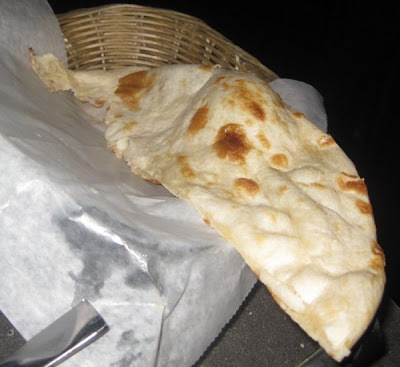 We also split an order of naan, which was yummy. The portion size was fine for us, but if you're a big naan fan (or just not of the sharing persuasion) you may want an order for each person. The other adventurous aspect of Radhika is it's about to expand to incorporate a tapas lounge in the adjacent space -- that's right, folks, Indian tapas! I am so excited. As much as I love food, I frequently don't have the stomach space to finish a full-size entree so I love tapas as I can taste a bit of everything. The tapas portion is scheduled to open in about a month -- I will have to go back after mid-October. 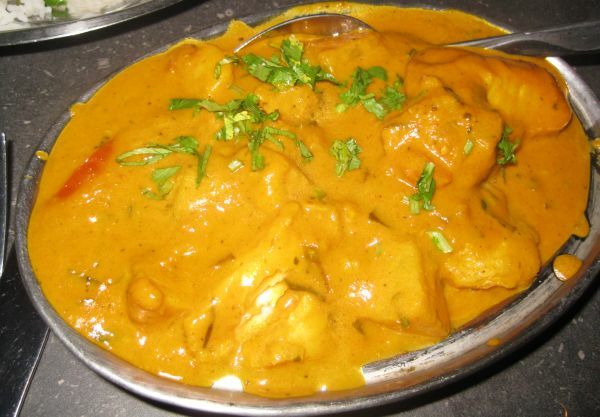 Have you been to Radhika yet--what do you think of it? For any long-time fans, how does it compare to its former Pasadena location? And, who else is excited about the tapas lounge? Radhika, 966 Mission St., South Pasadena 91030. (626) 799-2200. *Not sure if I spelled Kiran's name correctly, as I didn't want to ask and blow my cover. Love the photos, Sree! They're making me hungry, perhaps for some saag. ;) You are a blog goddess already!